These are pages on this blog so can be accessed any time through the link in the right hand margin. EDIT: 07:50 am (BST) Sorry about the missing Mr Linky attachment..please don't ask me why it didn't publish, it must be a mistake I've made....however - I started again and it's worked. So now you know, come on and join in, we need to know what other people are doing. Well, I do. I find it inspiring. If only for my shopping list! Here's mine; taken late Tuesday..basking in a weak sun that has broken through the clouds a tad too late. Shucks. Oh look at the over exposure on that. Ah well. You can quite clearly see that my plan for Tuesday did not come to fruition. The 'to do' list pad is centre stage...with no list on it. But still, the printed page is way prettier than any deadline! At left is a plastic file thingy that contains real work type papers and at right you can see a Chic Maker jewellery kit that I have every intention of getting to. I think it was April's kit. 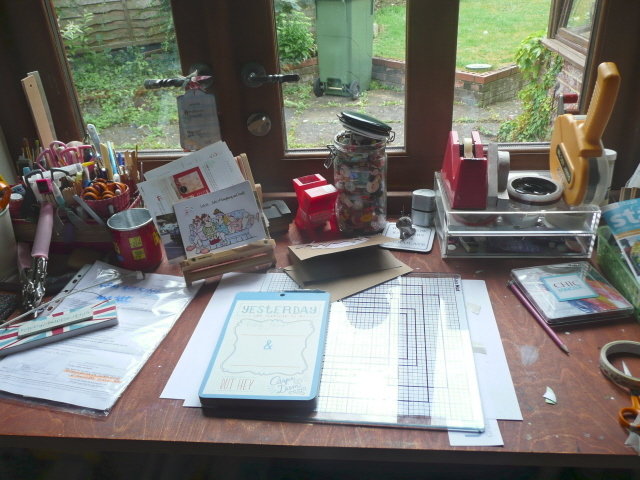 The button jar overfloweth, the deckchair that I use for an ipad stand is housing paperwork and a fabulous card from Deeyll; I will show you that detail another day. The acrylic drawers that are usualy slightly (!) hidden by detritus contain and corral the desk essentials like foam pads, glue dots, ribbon-into-bow-maker-template-thingy and other such blahdy blah. The silver lined pot still awaits a nice spruce up with some paper. Somehow I feel obliged not to use it like a pot and put things in it until I've actually 'aletered' it. From a pot to a pot. yeah, don't get me started about 'altering'. The green wheeled bin outside the window is for garden waste. Yes, gentle WOYWWer, I spent some of Sunday on my hands and knees, trying to get the better of next door's gifted bindweed. I actually did some gardening. I know - my creativity has absolutely no limit! Show and tell then, please - spare me the agony of more weeding. The weather is incredibly unpredictable. I am already missing the constant sunshine and the surety of getting laundry hung out and dried on the same day. Man, I'm so domestic. This, taken at about 7.25 this morning needed a flash. Shame huh. Still, it's only my first cup of the day and I'm already getting stuff done (sort of), so it's all good. The crochet you can see is the last of the squares to be joined vertically to create long rows. The joining of the horizontals will happen as winter approaches and I have a need to be buried under shed loads of growing blanket! It's an ambitious first crochet project. A blanket for our bed. It may not be perfect, but my goodness, Mr D has already come to realise how much he loves it. (I told him, see.) 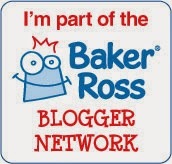 The shot is actually so that I can take part in Elizabeth's comforting blog hop T is for Tuesday. I love the idea that around the world we are all bound by drinking a nice cup of something as we go about our day! Talking of going about the day.. Mr Dunnit has dispensed with my help this morning, so I'm trying to get on. This card, propped on my ipad stand (which is actaully a book stand..) is actually hiding a copy of the new autumn workshop schedule in which my name appears frighteningly often. I thought that before I get to be Van Driver of The Day, I might attempt to make some sense of the commitment I made to creating workshop samples. In advance. People, that whiney last post...the list just gets longer, but really, it's OK..no-one minds the work as long as there's some time to play, huh. Make up job bags and cutting sheets for business orders that came in this week: this helps with scheduling and let's face it, a customer likes to know 'when'. Bring July up to date in terms of book-keeping: this will help next week when the VAT return needs to be submitted. More work on personal tax returns : because it's easier in small chunks, and doesn't make me so resentful of my time! Telephone various people: really, customers, people I'm planning to work for and even my sainted parents - this is not a difficult thing! Food shopping for the weekend: before the weekend would be better, huh! Unpack and put away after yesterday's workshops: as in, stop tripping over and moving the tote bag around the room and just deal with it. Hang out some washing: I can hear the machine spinning as I type, and let's face it, there's always another load to do. Encourage some tidying and hoovering in Miss Dunnit's bedroom: which really means..here comes another load of laundry. Take Miss Dunnit to town for a couple hours birthday shopping (hers). If her day off really isn't going to be spent languishing in bed. 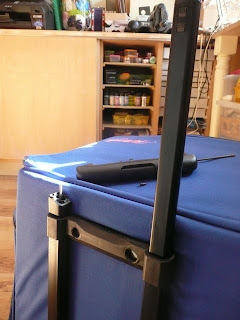 Hhhhhhhousework: how do the spiders get in and why do they repeat cobweb work so fast? Samples for new workshops: the Autumn schedule has been published. You are committed. Get on with it. Grass needs cutting: since it rained this week, the damn stuff is growing again. At least start the Gelli printing course: I think I've talked the talk for long enough, huh. Finish crocheting the verticals on the blanket squares: it's perfect 'evening in front of the tv' work, making up the rows. 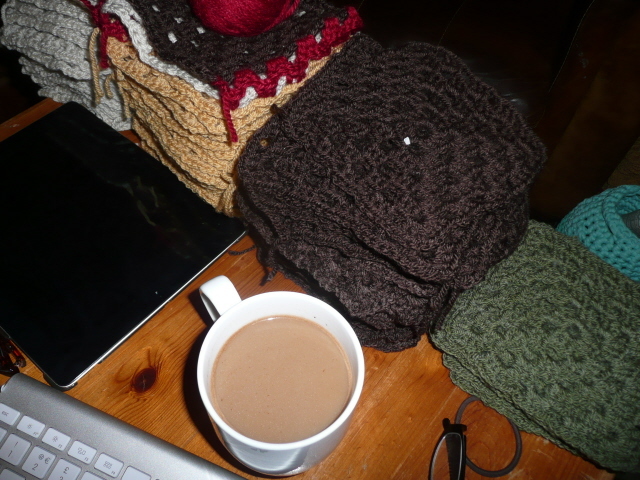 Crocheting the rows together will wait until I need to be covered in a large blanket! 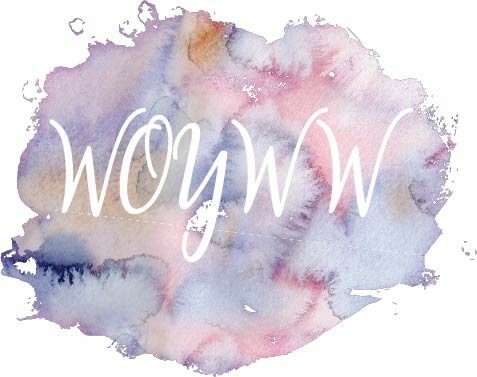 Finish visiting WOYWW blogs: because I want to. Open up the product that you've been sent to review: Use it and review it. Simple, huh. So...you wanna explain to me why I've chosen this morning to embark on a couple of sewing projects? Neither of them have any sort of priority. 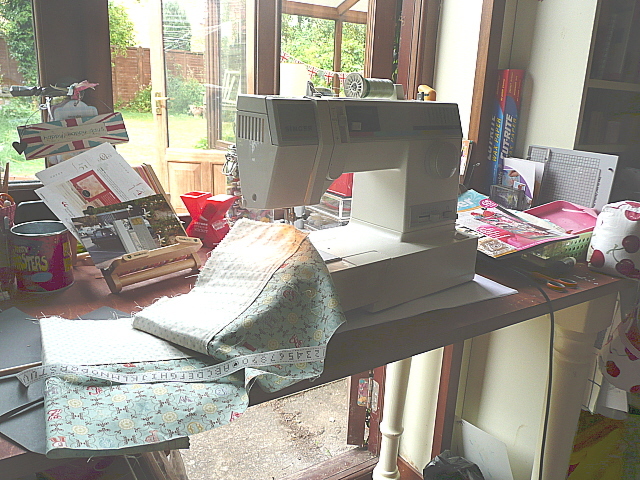 I hate sewing on my workdesk but the dining table is in the conservatory and that's too hot. 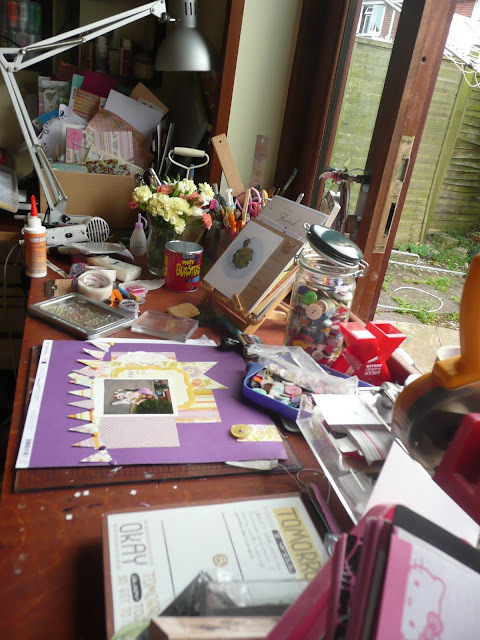 Using the desk means a bit of clearing - although as you can see..I haven't done much. The situation is apparently so temporary that it wasn't worth even that effort! So it's not even convenient. Answers, please, if you know - and more crucially, if you can cure me! This is a wing and a prayer posting. The internet and cable tv provider that we use has made a mess of some new cable work. This means several vans dotted around the village, lots of head scratching by engineers and incredible frustration for I don't know how many customers who haven't had access to TV or internet services for 48 hours. Yawn. Meanwhile, thanks to my tarting some WiFi from Laura, here's my desk. it's tidy! I was going to show you the before shot too, but to be honest, it may be a little too traumatic. Instead..enjoy with me the new gelli plate..the last time you'll see it clean, for sure. 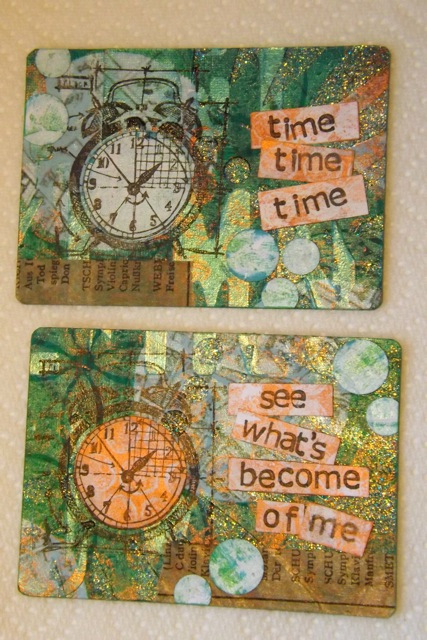 Got it from our Jennie at the Artistic Stamper. The other stuff is not very clear, but it may well scare you to know that it's Seasonal. Yep, with a capital S. Urgh. shopkeeper Gal made me, she wants Seasonal workshops - soon. join us then will you...assuming that scheduling and the Link list work. If it doesn't, ah well, it won't be for the nt of trying! Mary Anne and I had a marvellous long morning to ourselves earlier this week. We went to the two local quilting fabric shops that this small area boasts and did chit chat all the time. 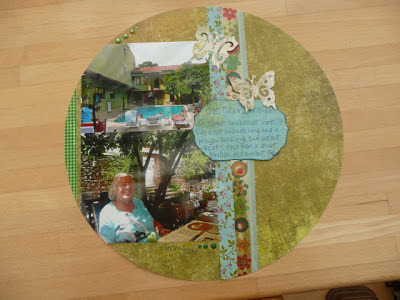 A lot of that chat was about Mary Anne's experiences with her Gelli printing. (I am about to become a novice Gelli-ee, see). Check out her blog at scrappystickyinkymess.wordpress.com , if you haven't met her already. Full of her AMAZING stuff. 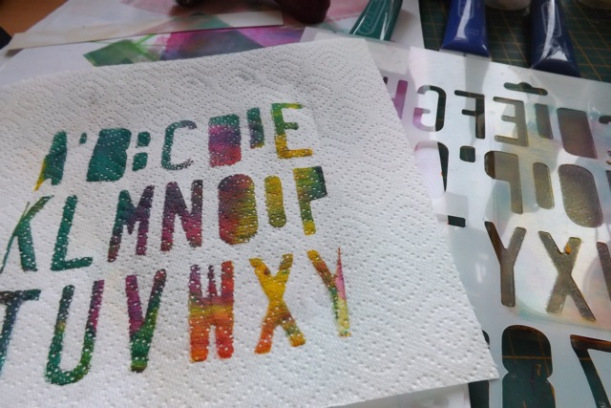 Now, despite her extensive stash, experience and amazing knowledge, Mary Anne reckons that 99% of the time, she wrecks a Gelli printed piece because she adds a another layer. Of something. Now I honestly can't say that I've looked at her prints and ever thought that. I mean, what do I know? 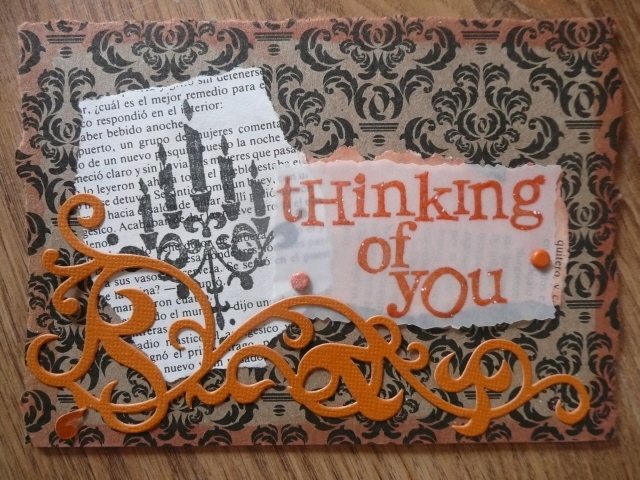 Sometimes yes, I look at a card that has the die cut, the cute image and the ubiquitous flowers and wonder if the maker had to be stopped before adding a banner or a schmaltzy sentiment. God knows, I need to be told to stop...specially if it's about adding words..embellishment kinda creeps up on you and suddenly..more is everything and it's too late! Mary Anne's...do you see a last layer that spoiled it? When it looks exactly like the picture you had in your mind's eye when you started Does it ever? When you think that one more (layer/gem/flower/piece) will make it PERFECT? Is that the time - before or after the one more...? When the time is up? 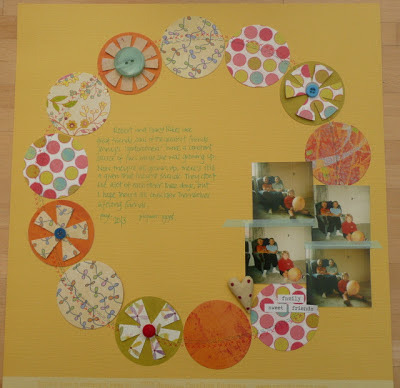 Do you have to have achieved 'something' in your heard earned craft time? When you're tired of thinking about it? Or are you on auto pilot, just enjoying the doing? Is at the end of the method for that particular technique? Or can you just keep going because you're enjoying it and it comes good? Do you even know if you've over worked something? Does it matter? If it does, what then..more work or file 13? I guess it's alright if you haven't thought about this in depth. Clearly, I have. Since Mary Anne went home and I've done a couple hundred miles in the white van, musing over this. Let me know will ya, what you do. Or if you need us to stage an intervention. Here for ya! Join in do..you'll meet some lovely Deskers and you'll be amazed at the amount of craft work going on around the world. Here and here tell you how and why. This photo was taken at dusk on Tuesday - about 8.30pm. I found myself with an hour to kill between commitments on Tuesday afternoon and had to wrench the idea of sitting outside from my mind...I needed to stay fragrant and relatively cool! So, guess what - I flung open the patio door, pulled the first photo out of the pile 18.6 kerjillion waiting to be scrapped, located a sketch and went for it. And that's what you can see on the desk. I am a creature of enormous habit. If I have an early start to my day for whatever reason, I'll make it a bit earlier. I need (need) two cups of coffee to kick start my day and I like five or ten minutes to myself, catching up on my blog reader. Currently, the weather is set fair in dear old England and I'm enjoying lots of deep sleep and very early mornings. Mr D is an early riser and in the summer weather, I've adopted the habit. I like the early morning cool and after the coffee, I can get about and do chores before resenting having to stay indoors. I think I am very typically English in this sense...I have a nagging guilt if I don't 'make the most of the good weather' by being outside. And so, I've another new habit... I'm carting stuff outside to work on, or even more extraordinarily, I'm doing real outside chores. The porch is next, needs sanding and re-coating...gah, the work habit thing is not what I intended. 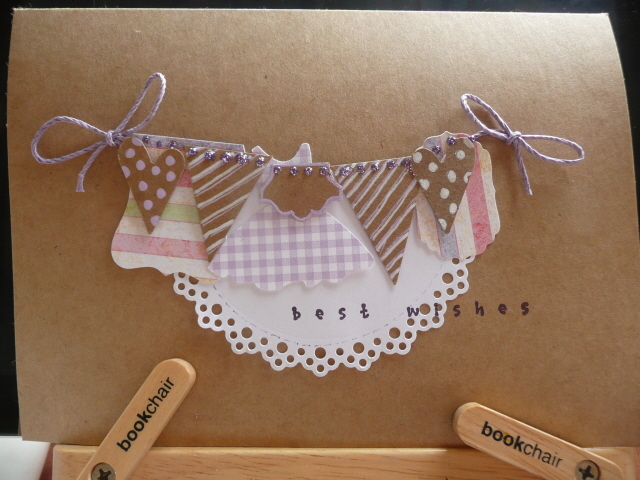 To start today, I have a birthday card to make (for today!) 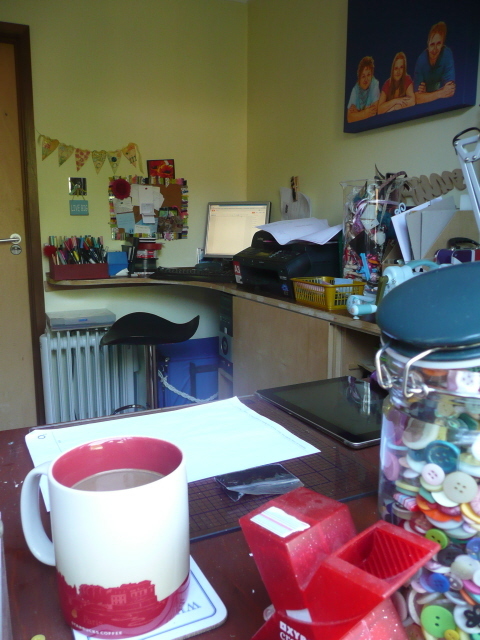 and so I've cleared my desk, set down my second coffee and any minute now, will stop procrastinating and get to it. This revelatory post is coming to you via Elizabeth's T is for Tuesday gathering. I love the idea of relating a post to whatever cup or mug is currently in use at my side - probably the most universal of habits! This over exposed and grainy photo was taken on my ipad..from a different room (almost the North Wing) and in a hurry. 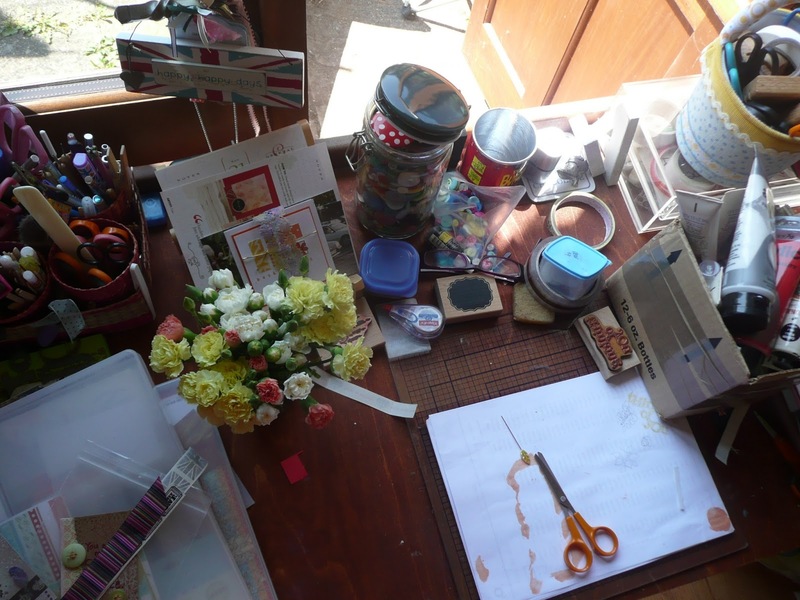 It's my workroom....my desk..my mess. And Laura. Laura fell into my life about eight years ago when she started coming to the Crop. She is lively (young), enthusiastic (young), funny (young) and incredibly patient with me (much older). She is also a gifted paper crafter. Anyway, like a child in a sweet shop, Laura snatched up the chance, stood at my desk for oh, I don't know...twenty seconds, and put the card together perfectly. Obviously, I blagged my way out of it by saying that she's done pretty much what I had tried and that meant it was obviously OK to stick down and commit to...but really. It had to vaguely match a sketch...that's my only defence really! This is pretty much Laura's MO. She gets the elements together and spends a bit of time on preparation and then in a flurry of hand movements, she's done a fabulous LO that just leaves us mortal croppers a little breathless. Actually this month, Laura is the Guest Designer over at Counterfeit Kit Challenge. 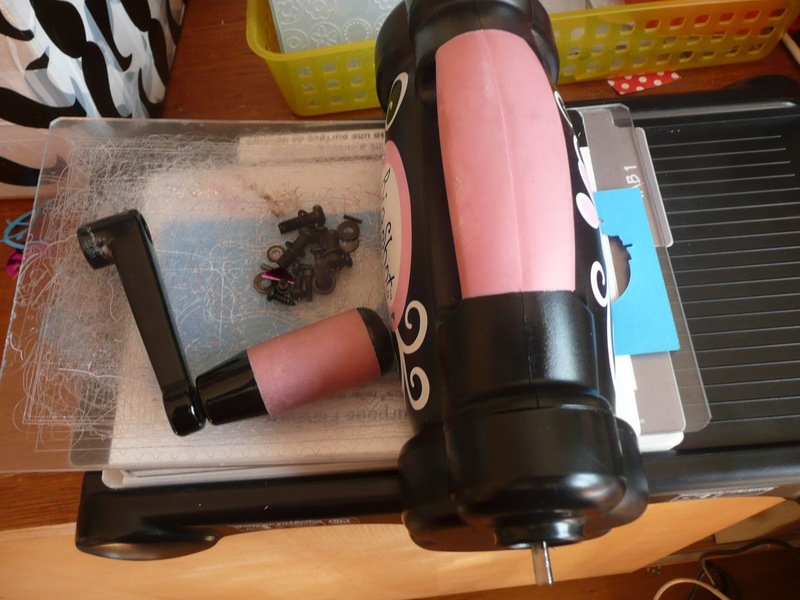 On her blog she walks you through how she arrives at her counterfeit kit and then periodically posts pictures of the LOs that she makes with it. She's amazing. If you're a scrapper, you need her blog in your reader...if for no other reason than to remind you of the wonderful things you could be making from the stash that you already have. Have a lovely weekend, y'all - shaping up to be hot here in Blighty, so I'll be looking for gentle outdoor jobs that involve a chair. Now, because I have juggled about with the posting times, I'm having to schedule this. If you know me at all by now, you will know that I don't tidy up for the camera, and because I now have to stop and take photos for an 'earlier' posting, sometimes you will find me, erm..'mid flow'. So there's the excuse and the explanation all in one. The stable door is fully open onto my weed ridden patio - tis a beautiful summer's day..my car says it's 25C and that makes me happy. And requires more of my will-power than any diet ever did...I just want to be outside! My desk is actually about stock taking and putting away, believe it or not. The box with acrylic paints in has finished being used by Miss Dunnit; she is pathologically incapable of putting anything away, so they are waiting for me. 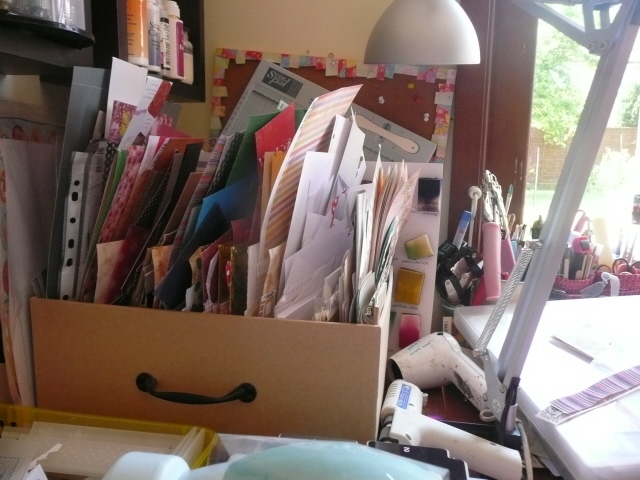 However, I need to rummage through them and check stock because..(you won't believe this)....I have an on-line course to attend and ...wait for it....it's all about the Gelli! Yep, my sweet Sissy has brought me a course as a birthday gift and so I figure I may have to dust off the old learning curve and get on it! The 12" storage boxes on the left are waiting to be put away after the Crop and the stuff on top of that is well..stuff. A lovely handful of carnations slung in a sturdy bottom mug to keep me company - pretty huh. And last week somebody mentioned my scrap box, which is just visible when you take a long shot from the other end of the desk...here it is - not too bad I guess...could do with some using! 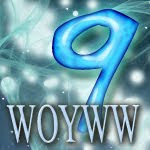 You can join in with WOYWW very easily. Which means more than just linking; of course it does. 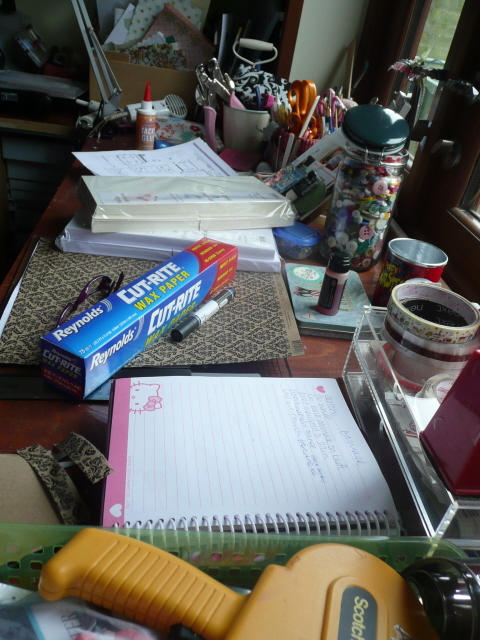 'How to' pages can be found in the right hand margin of my organised and efficient blog space. *Ahem*. Join the community, do. Which means more than just linking; of course it does. Don't link a post that isn't about your desk or what you're working on, and don't link a post that's a blatant advert. Here's the linky then.. Tomorrow is Crop Day, here in Ludgershall. I thought to torture you with proof that at least for one day of a month, I actually do what I type a lot about doing. 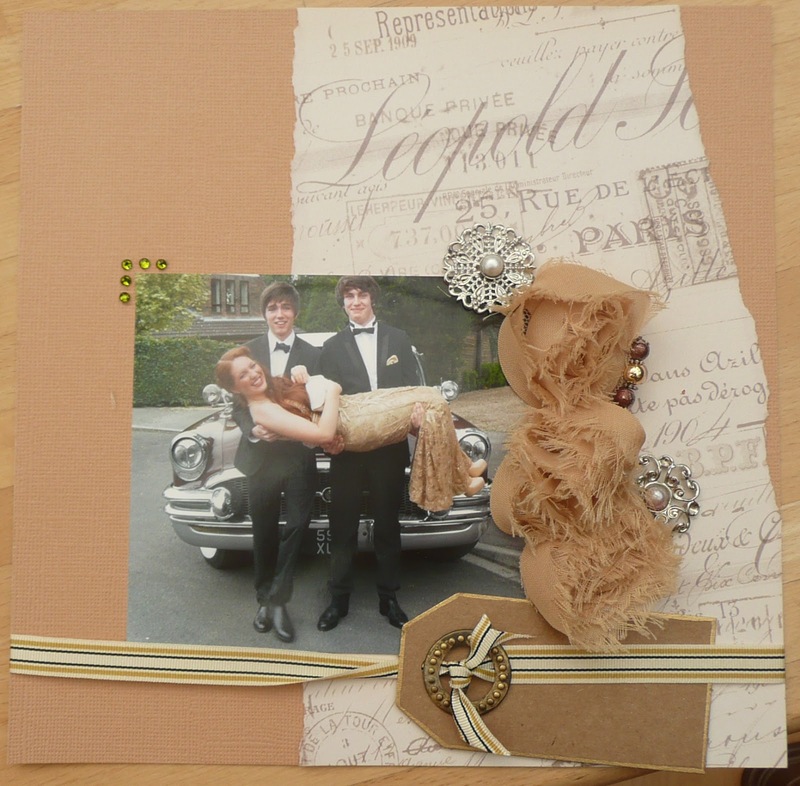 I'm not a scrapbooker of extraordinary talent, but I absolutely love doing it. I love the social day of the Crop, I love finishing and working on bits and pieces at home surrounded by all my stuff, I love taking the photos, I love the recall of memories, all of it. You know that I'm less enthusiastic about the packing and the choosing.. putting the pages together doesn't come as naturally as I'd like it to. Obviously, the packing part isn't because of that. That's because I've got too much stuff and need to take it all because I'm a little disorganised. I know it's hard to believe, but in this very room on a Friday prior to Crop....believe me! 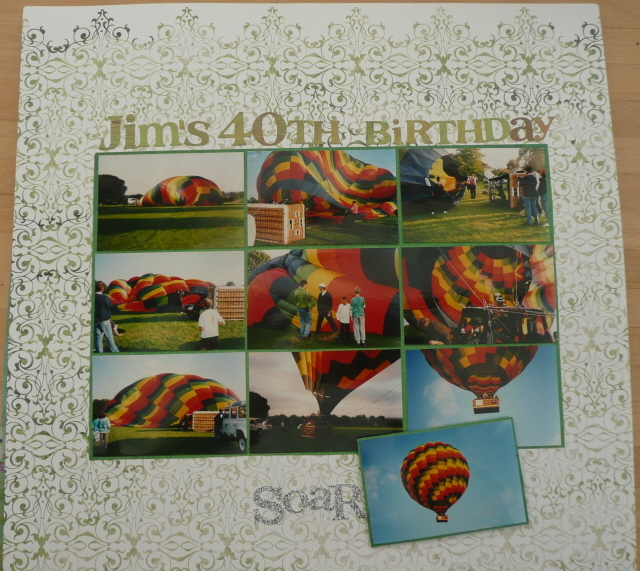 Take Jim's 40th birthday for example. Set aside your shock that Jim is now 56, because really you wouldn't know it, and I need time, people! Set aside my foolish reluctance to do a double page (I can't, Mummy, it's too hard) and concentrate on the word at the bottom. The challenge from Mr D was to include one of the - and I quote - 'arty, motivational words that you lot use'. Well, no contest really, although I could easily have contrived the LO to include 'imagine' or 'dream' believe me. Ha! I win. I must remember to show him! This is a teeny page for the Prom Album that is a gift for the Mother of (one of those) Prom boy. I use the word 'boy' advisedly. And that's why the tag is blank. Apart from the Boy, I don't know who these people are and I can't really make up stuff now, can I? Incidentally, scrapping other people's photos is fun. No emotional attachment to them means you just get on with it. Wham, bang done. Thank you and goodbye. Enjoyed it, I can tell ya! 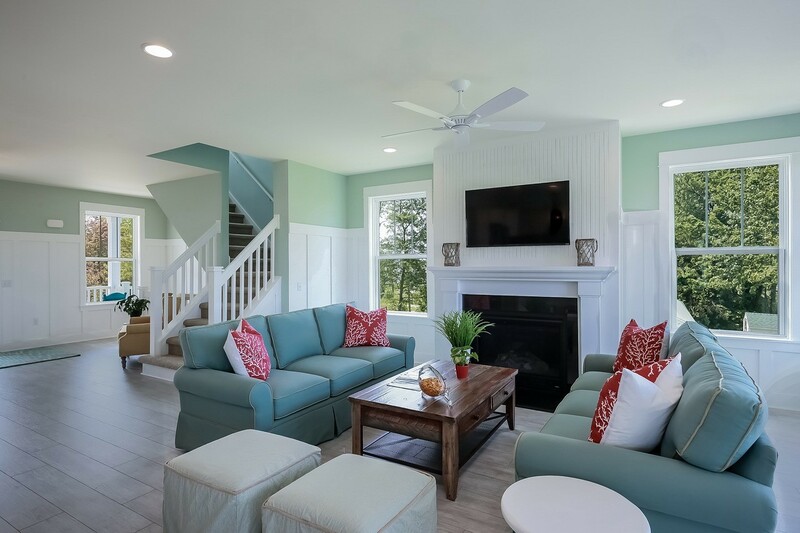 This is a bad and blatant copy of a LO that I saw on Pinterest. If it's yours, let me know - I'd love to credit you because I'm going to be using the idea again and again, I love it. I know the circles are really too large for the teeny photos, but I like it anyway. And hey - it gets those particular four photos off the pile - I love them but really, they aren't much, huh! Barb..if you're reading this..so glad you may have felt the spark of inspiration from us WOYWWers! Taken from the North wing end and looking remarkably similar to how I left it last Thursday. Shopkeeper Gal has had the amazing good sense to stock the Reynolds (not a common product in the UK) and she mostly sells it as a great release paper for stubborn thin dies. I've met in other guises and so plan to have a bit of an inky play. Plan. That's all I can commit to just now. Let's face it, the last few days have been all about the cutting station work surface and the pigging Big Shot. That's over now, so I guess free time can go back to being desk time. As soon as I tidy. A bit. So that's boring of Ludgershall for you today. Show me yours..it's got to be more interesting! You were so nice to me about my Big Shot breaking. No one mentioned that I'd obviously overdone it once too often. Thank you. We've had time to take it apart today. That's a bit of a joke..take out loads of screws and nothing really shows itself. 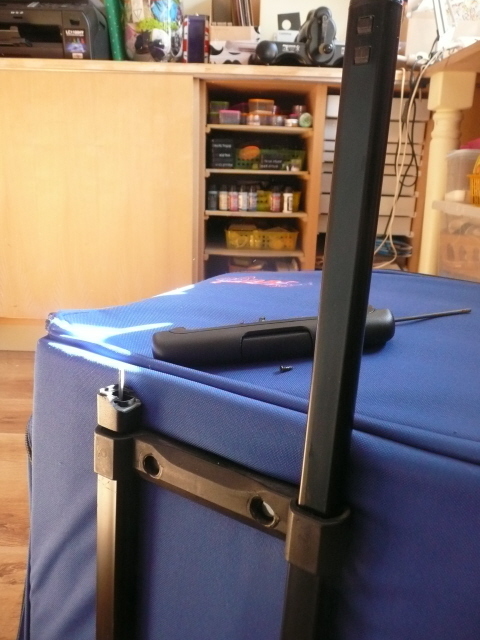 Take an allen key to the little spot behind the handle and that reveals everything. Certainly well built, this Big Shot, but not intended to be repaired! See the half wheel of cogs that should be a whole wheel of cogs. 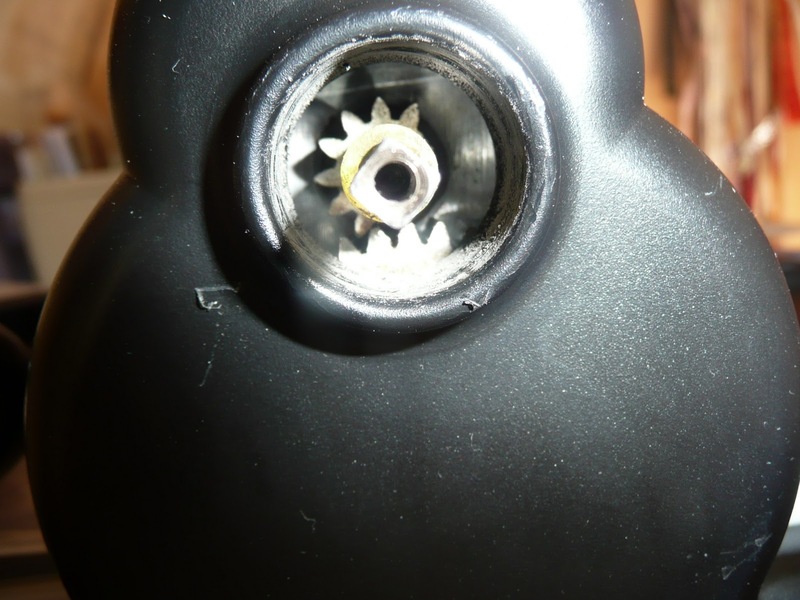 You'd kinda like to think you could just get a new cog, but we can't get into it to remove or replace. Ho Hum. Rhymes with Bum. That's why the plates are stuck in the rollers..won't go forwards and certainly won't go back...but we did manage to wrestle the die out of the sandwich, so I'm pleased about that. And then, just as I was getting over the Big Shot, I moved the tote bag into the middle of my craft room in an attempt to remind myself to empty and sort it. And the handle broke. PING...it really went, and a bit of insidey metal popped out and the handle came away in my hand and the bag hit the ground I swore. Sorry about that. It's relatively new to me, as a gift from a crafty friend who had one too many. So that's bad luck, huh. Mr D has valiantly attempted mending, but it's a gonner. So I'm going to browse some very unintersting industrial storage catalogues and see if I can find something that might replace it in. Plastic, wheels and space...it may last longer if it looks awful! So this post isn't one of my long whines about inferior quality or products not being up to it. Not at all. It's more a lesson in expecting more than the product should be expected to deliver. I will be replacing the Big Shot with another Big Shot. It's the tote that may well get a very practical downgrade - just to become 'me' proof rather than because they aren't built well. Watch this space - storage is such an issue. Ah well, these things happen. I shall be more careful in the future, I promise. And there won't be third..there's really nothing else that could break in the old craft room. Is there?